This was one of the first posters I had the opportunity to create from start to finish. Previously, JS films had asked me to finish up projects when their designer had let the jobs fall through the cracks. John came up with the cracked glass idea. I figured out out how to do it, but it fell a bit flat. So I changed the images to black and white, then colorized one part of each one. 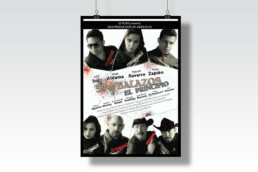 JS films was very happy with the poster, and I was lucky enough to do another 17 posters for them.